Eagle-Vail’s Mikaela Shiffrin picked up her eighth World Cup win of the season Tuesday night in parallel slalom city event in Stockholm, Sweden, adding 100 points her overall lead over Switzerland’s Lara Gut. The victory was the 28th of the 21-year-old’s stellar career, putting all alone in 11th on the all-time career wins list. If Shiffrin hopes to become only the third American woman to win the coveted overall World Cup title for the ski racer who earns the most points during the entire season, she’ll have to push hard after the World Championships that start Feb. 7 in St. Moritz. There are only four regular-season World Cups still on the schedule after Worlds, with just two slalom races — Shiffrin’s specialty. However, she’s also won two giant slalom races this season and finished fourth last weekend in a super-G. Gut excels in the speed events of super-G and downhill and can also win and score well in GS races, but she typically does not compete in slalom. It all may come down to the World Cup Finals this March in Aspen, where Shiffrin won two World Cup races in dominant fashion last season. Shiffrin is looking to join Vail’s Lindsey Vonn (American record four overall titles) and Tamara McKinney, who won the overall championship in 1983. For the World Cup calendar, go to the FIS.com website. STOCKHOLM (Jan. 31, 2017) – There are times when a slight mistake pays dividends in ski racing. And for Mikaela Shiffrin (Eagle-Vail, CO), her first run mistake was the key to victory in Tuesday night’s Audi FIS Ski World Cup city event. In the first race of the evening, in front of thousands of energized Swedish fans, Shiffrin and Adeline Baud Mugnier of France were locked in a tight battle until Shiffrin went wide with seven gates to go. However, Baud Mugnier, sensing an upset over the No. 1 seed, pushed too hard and fell into Shiffrin’s lane. From then on, it was Shiffrin who was doing the hitting, knocking out the next two competitors she faced – Canada’s Marie-Michele Gagnon and home-crowd favorite Frida Hansdotter, to set up the match of the evening that all the fans waited to see – No. 1 seeded Shiffrin against No. 2 seeded Veronika Velez Zuzulova of Slovakia. In the finals, Shiffrin won the first run by a slim 0.10. In the second run, Shiffrin took a half-gate lead midway down to the course. But Zuzulova hit the gas and closed the gap over the jump. 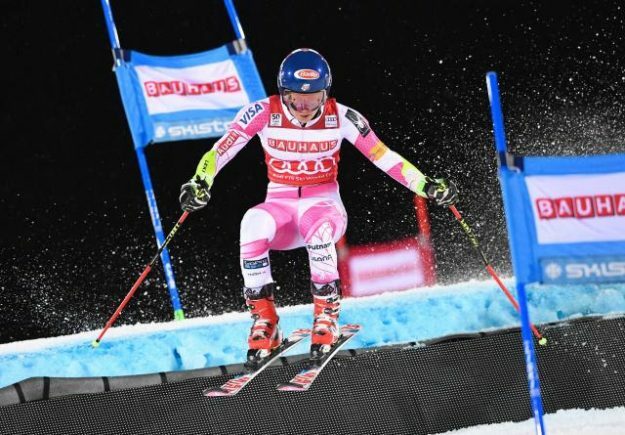 However, she carried too much speed into the final gates and blew out of the course, allowing Shiffrin to cruise to her first career city event victory and 100 World Cup points. In the men’s race, Norway’s Aleksander Aamodt Kilde upset No. 1 seed Marcel Hirscher of Austria in the first round, taking the first run by 0.02 and second by 0.03. However, Kilde was ousted in the next round by Alexis Pinturault of France, who advanced to the finals to face off against No. 15 seeded Linus Strasser of Germany. Strasser eliminated No. 2 seeded Henrik Kristoffersen of Norway in the opening round, then defeated Italy’s Stafeno Gross and Swedish favorite Mattias Hargin to face Pinturault in the finals. Strasser took the first run over Pinturault by 0.13, and then held on for a 0.04 victory in the second run of the finals to win his first career World Cup event. Up next, the 2017 FIS World Ski Championships kick off in St. Moritz, Switzerland next week with women’s super G on Tuesday, Feb. 7 and men’s super G on Wednesday, Feb. 8. Watch Tuesday’s broadcast of the city event to be the first to hear which Americans will be named to the World Champs team. Mikaela Shiffrin won her first career city event Tuesday night in Stockholm. Germany’s Linus Strasser won his first career World Cup victory. His previous best World Cup result was fifth in slalom in Schladming, Austria in 2015. Resi Stiegler (Jackson, WY) finished ninth after losing her first round matchup against Veronika Velez Zuzulova. Road to Aspen: Shiffrin added another 100 points to her overall World Cup lead over Swiss Lara Gut. Shiffrin leads Gut by 180 points in the chase for the overall title. Shiffrin also holds the overall World Cup slalom lead with 66 points over Velez Zuzulova with 515 points with two slalom events remaining this season. Marcel Hirscher leads the men’s overall World Cup Standings with 1,275 points. Norway’s Henrik Kristoffersen and Alexis Pinturault of France are tied for second with 843 points. Hirscher also leads the overall World Cup slalom standings with 635 points. It is a great event. The crowd is awesome. It was fun; it was really fun. I think it’s really good for the sport (for the fans) to be able to see that live head-to-head action, the battles, and I’m happy to come away with the win. Starting first, I had really no idea how the course was going to run, and I just tried to go for it. There was a bit of bumpiness at the bottom of the course, I actually just didn’t stand on my outside ski, but Adeline kind of hit the bumps and shot into my course. Actually it was quite lucky for me that I made that mistake and slowed down, because if I hadn’t she might have hit me.